Silver River, which was directed by Raoul Walsh, premiered in Denver on May 18, 1948, and in New York City two days later. Walsh’s last couple of pictures — Pursued (1947) and Cheyenne (1947) — were both westerns. Silver River takes place after the Civil War, and it’s set in the west, but in terms of action, it doesn’t deliver what I look for in a western. It’s more of a drama, and in fact bears more resemblance to one of Warner’s gangster dramas that it does to a typical Warner Bros. western. Like Little Caesar (1931), The Public Enemy (1931), and Scarface (1932), Silver River is about a man who takes control of anything and everything around him, wielding his own ruthlessness as a weapon. Like every good gangster, Michael J. McComb (Errol Flynn) has a faithful right-hand man, “Pistol” Porter (Tom D’Andrea), and he lusts after a woman he can never really attain. And just like every other movie gangster, he finds that once he’s on top, he’s lonelier and more isolated than ever. When the film begins, McComb is a captain in the Union Army. During the Battle of Gettysburg he burns a wagon-load of payroll money so Jeb Stuart and the Confederates won’t be able get their hands on it. He does this in defiance of an order, so he is court-martialed and dishonorably discharged. So after a stint as a riverboat gambler — in which we get to see Flynn deliver a lot of smooth lines like, “…and speaking of charming ladies,” before he drops four Queens on the table to beat his opponent’s trio of Aces — he and his buddy Pistol move their operation to Silver City and open a casino. The casino rakes in cash hand over fist, which allows McComb to force his way into the Silver River Mining Company run by Stanley Moore (Bruce Bennett). What McComb really wants, though, is Moore’s wife, the beautiful Southern belle Georgia Moore (Ann Sheridan). McComb’s lawyer, John Plato Beck (Thomas Mitchell), drunkenly warns McComb against the path he’s headed down, and invokes the Biblical story of King David and his obsession with Bathsheba. 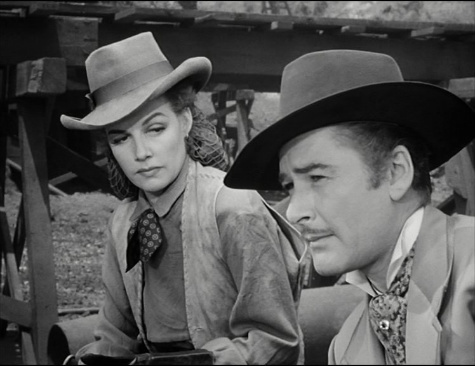 After a number of Warner Bros. pictures starring Errol Flynn suffered costly delays when he became too drunk by the afternoon to continue, Jack Warner was determined that Flynn be kept under control, and he made it clear that any delay in filming due to Flynn’s inebriation would be met with legal action. I don’t know if Flynn’s controlled but uninspired performance is directly related to his forced sobriety, but throughout the film he seems as if he’s just going through the motions. He hits his marks, but that’s about it. Walsh does a good job of controlling his star and keeping everything moving, but after the pyrotechnics of the opening sequence and the breezy charm of the riverboat gambling scenes, the film settles in for a long melodramatic slog, and there just wasn’t enough action to keep me interested. Worse, when there finally is some action to end the film, it feels like a betrayal of the narrative, and isn’t true to Flynn’s character’s arc. Posted in 1948, May 1948 and tagged Ann Sheridan, Bruce Bennett, Errol Flynn, Raoul Walsh, Thomas Mitchell, Tom D'Andrea, Warner Bros., Westerns. Bookmark the permalink. I’d heard this one was a washout and your review only confirms what I heard. Pretty disappointing when you consider the potential hotness of an Ann Sheridan/Errol Flynn pairing. 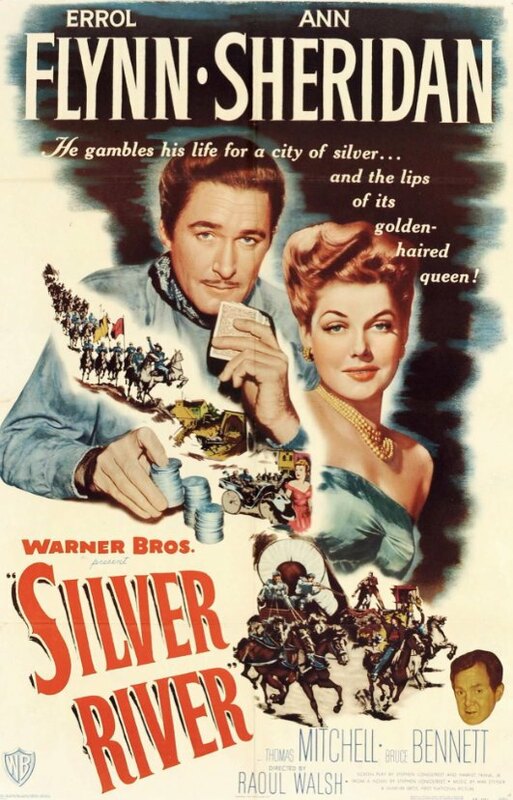 I know … I fell in love with Ann Sheridan in “Nora Prentiss” and it would have been great to see her and an energized Flynn in an exciting story, but “Silver River” is mostly a snoozer. It’s not any one person’s fault, though. It’s based on a novel, and the long middle of the film just feels like plot points being played out. There’s literally no action for most of the film. There are a few cute scenes with Sheridan and Flynn in the beginning of the movie that have a lot of sexiness lurking beneath the surface, but unfortunately once they arrive in Silver City not much interesting happens.